Live Like the Rich & Famous, Off 18 th Hole of Harbour Town . 8 Free Bikes ! 8 Free bikes await you at this special home designed to replicate the Southern plantations of old. This custom home offers four full master suites, each with its own private bath and veranda to accommodate family and friends comfortably. The great room, which is combined with an award-winning kitchen design, was custom designed for entertaining and comfort leading to the rear veranda with pool, hot tub, outdoor grill and, of course, another TV. 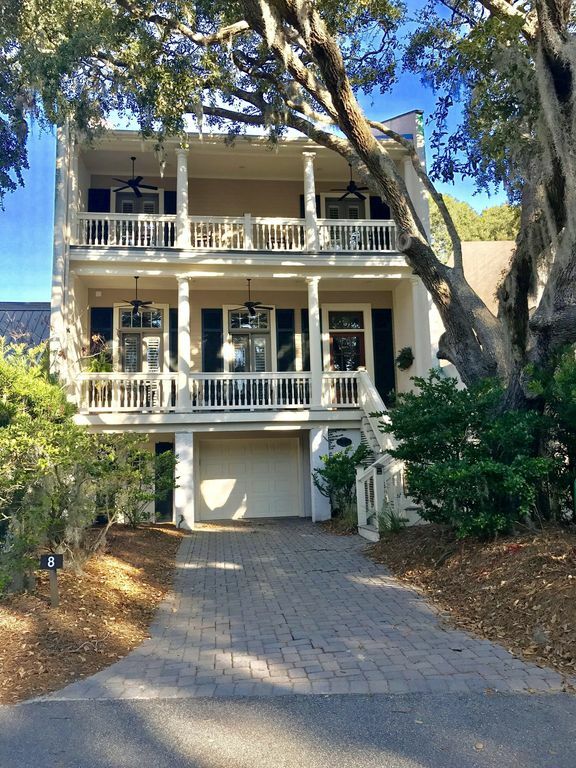 Located just a short stroll to Harbour Town with all of its restaurants and activities, this home is just off the 18th fairway of the renowned Harbour Town golf course.Take the trolley to The Beach Club or just stroll over to hear Gregg Russell sing under the huge Live Oak Tree. Something for everyone..FREE bikes & wonderful bike paths go around the island..huge award winning playground & 4 star CQs restraunt in Harbour Town,,alot of outside cafes with singers & all you can eat crab legs for Happy Hour..walk to Beauty Salon, Boutiques with the latest fashions, gourmet wine & coffee shops. Take the Ferry over to Savannah & eat at Paula Deens; ,leaves in the morning right from our harbour,or take to the water taxi over to Danfuski Island. Rental is on a 7-day weekly basis, Saturday to Saturday. As you check the available weeks, please note that you'll receive significant weekly discounts from the stated daily rates depending on the season. We purchased the lot and built our dream home in 2000. It was designed to live and look like a Charleston townhouse. We love the location because you can walk to everything, and your surounded by golf courses. You can take the beach trolley or bike to the most beautiful beach in the world. You are just a short stroll to the famous lighthouse and harbor with lots of interesting boats. Rent a boat or jet ski for the day. Enjoy the quaint shopping village filled with boutiques and cafes, all within walking distance of our home. We custom built our home in 2000 to be nestled in a Huge Spanish Oak Tree,its located on a quiet street surrounded by The HarborTown Golf course. We love the location because you can walk everywhere, from fine dining at CQs or a drink at the local pub "Crazy Crab. Enjoy a drink by the famous Red & white LightHouse over looking the 18th hole and watching all the boats come in or listen to Greg Russell singing under the Liberty Oak Tree or take the trolley to The Beach Club. When you enter our home, you will fall in love with the quality of all the wood floors, custom bookcases filled with the latest books, custom MacKenzie-Child sinks in each private bathroom. extra high 12 foot celings, Great room with media center & surround sound, HUGE custom built dining room table fit for a King & Queen. Each Bedroom has a private verandah with rocking chairs & private bath. This is a VACATION HOME WHERE MEMORIES ARE MADE TO LAST FOREVER !! toilet, shower, Guest first floor 2nd Master with Master Bath and veranda. toilet, shower, Master Suite with jacuzzi, shower and private veranda. The beautiful Sea Pines Beach Club is just a mile away and can be reached by bike or the trolley the picks up at the end of our street in front of the new Harbour Town club house. The beautifully scenic Harbour Town village opening to the Calibogue Sound is just a short stroll away and features many shops and restaurants. Casual strolls are especially enjoyable in the evening. Just off the famous 18th fairway of the Harbour Town signature 18th fairway and a short stroll to the fabulous new clubhouse. Premium Newer Extra Large, perfect for beach Towels ! 2 or 3 cars can be parked tandem in garage. Additional parking in driveway. Free Internet in home with no password required. Automatic, high speed. No password required. New stainless in 2018 with ice-maker and cold water feed. Fully complimented with all you'll need to enjoy and entertain. Bookcases are loaded with a variety of books. 8 quality bikes ready to ride in addition to an adult 3-wheeler. Loaded with rockers under the surrounding live oaks with their Spanish moss. A large deck in the rear with pool and private decks off of each bedroom for the ultimate in relaxation among the branches of the live oaks. 15 x 9 (5 foot deep) Spa Pool for cooling off and relaxing with a waterfall flowing into it from the hot tub. The four bedroom house was great for out visit. Everyone in our group had plenty of room. The kitchen and family area is well designed and also very accommodating for our group of 8 adults and 2 children. The location of the house was an easy walk to the Light House area and just a short trolley ride to the beach. The home is beautiful and In a wonderful location. We had some issues with things not working (grill, stove) which made having dinners in a bit more difficult but overall was very happy with our stay and would happily stay there again. Thanks for sharing your beautiful home! You for much for loving our Beautiful Home . Great home and fabulous location! We loved our time in Hilton Head and 8 Mizzenmast was a perfect fit for what we were looking for. I highly recommend this location. First class accomodations for a first class vacation spot. We are so happy your enjoyed Our Dream Home ! We built it in 2000 & wanted a quality home with 12 ft ceilings, hardwood floors everywhere, custom sinks & tile showers. Plus I love all the porches with 12 Rocking chairs! But Location, Location you can walk to Golf, Tennis, boating, dining, playground,Lighthouse ! Did you use our FREE Bikes ? Lovely home in a great location. It was ideal for four couples! The home was great for our family vacation which included 7 adults. It is a well built , lovely home in a great location in Sea Pines! We had a couple of snafus when we first got there . The door code didn’t work and the rental company wouldn’t help my dad or my brother gain entry because I was the one that rented the property. However I was traveling en route. I finally was able to call the company and they reset the door code. But my family was stranded outside for an hour. Then there was only 2 car passes at the Sea Pines Gate even though I had ordered and paid for 3. So my sister waited at the gate over an hour while I tried to contact the rental company on the phone. They kept telling me they would call me back in 10 minutes and were working on it. Then they said they had a local person working on it and they would contact me. Never heard anything for 2 days! So my sister bought a pass . Just aggravating . The company did reimburse me for the 3 passes at the end of our trip, but it was still frustrating. Primarily the lack of follow through on their part and leaving me hanging several times. The only other negative thing I should mention is the sheets, towels and toilet paper were extremely poor quality. Paper thin towels and face cloths . We went out and purchased our own! Also, 2 of the stove burners didn’t work which limited our cooking ! Literally everything else was great and we had a wonderful time in a otherwise wonderful home. I would recommend this house to rent just be aware of the linen situation. In addition, parking was a serious issue with four cars. There is a single driveway with a garage that houses 3 cars in a single file. 2 of our cars wouldn’t fit in the garage because they were too tall ( 2 SUVs) so we had to park one car off premises. Sorry about your difficult time getting into our Gorgeous home. We just changed Management companies & we will be meeting them! Please understand everything you address will be improved. Hope you enjoyed our Free bikes . Hope to see you next year ! A Must Stay at Place! A wonderful house to stay in! You are close to so many dining options - shops - beach - parks, etc. The owners make you feel so welcome and taken care of. The house is full of southern charm and will meet all your needs. The pool and hot tub were a nice bonus to have along with the bikes, etc. Thank you ! We custom built our home in 2000 & a lot of thought went in to the 12ft high ceilings,wood floors & tile baths ❤️ Love our location, you can ride our Free bikes to the beach,playground,Harbor town ! We had a large group who rented the entire compound and it was perfect. ove the place! We rented for 3 days for out real estate team attending conference in Charleston and will do again next year. Walk to Harbour Town & listen to Greg Russell under the live Oak tree. Walk to many shops & cafes and playground.